After crash-landing on an alien world, The Solus Project starts off slow and uneventfully. A player’s first act is to craft a sharp rock to cut away netting from their ruined escape pod and emerge onto the planet. Don’t be lulled into complacency though — a few minutes later, the game throws a literal tornado at the player as if to say yes, you will die here. 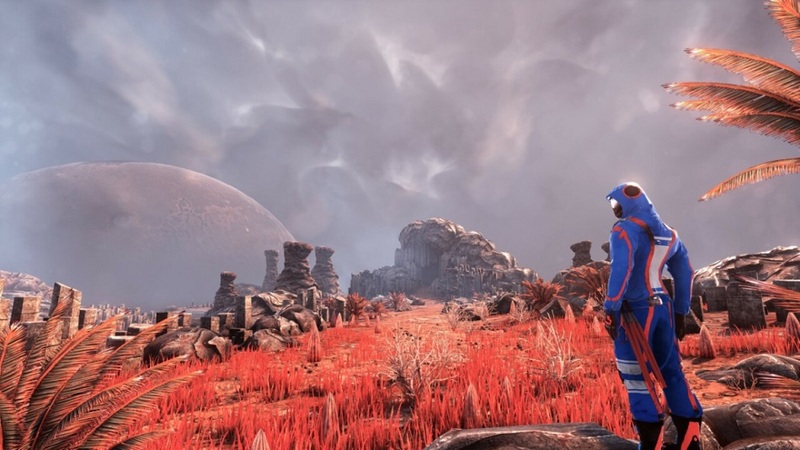 As a first-person survival title, Solus rewards those who settle into experiences rather than those who expect the best sequences right at the start. Apart from that opening tornado, the moments of awe and intrigue come as the player engages in an exploratory survival adventure on a strange world full of ancient ruins and machines. Unfortunately, the mechanics and design don’t match the thick, successful atmosphere. After the crash, players awaken to find themselves the only survivor of a mission to save humanity. This setup launches a quest that tasks players with determining whether or not the mysterious planet might be a potential new home for humanity. In order to accomplish this, players must gather local resources, craft useful items, scavenge the wreckage of their spacecraft, and discover the secrets of an ancient alien civilization before it’s too late. Solus excels at creating a genuine atmosphere of isolation and distress. In order to survive, players must monitor their heat levels, hydration, nourishment, and other biological factors using a small computer they permanently carry in their left hand. This computer also tracks progress on quests and translates an alien language found around the world. Meanwhile, the player’s right hand is free to wield useful items such as a torch, food and drink to be consumed, or a device that fires teleportation disks to make traversal somewhat easier in difficult terrain. 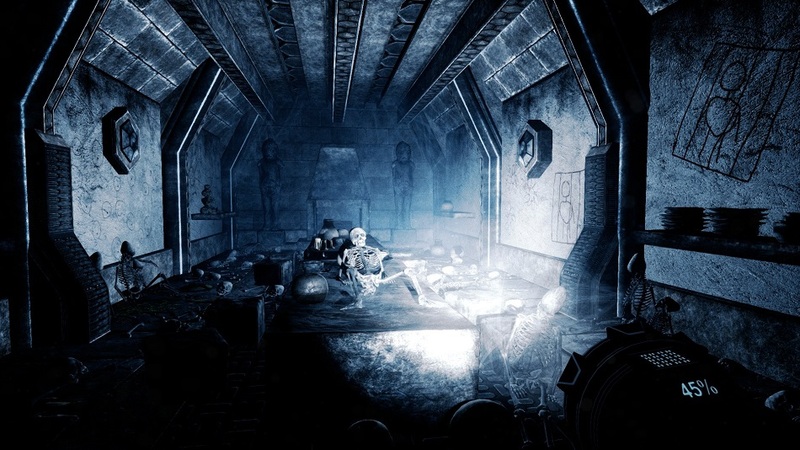 Desperation sets in as players realize that they are susceptible to dangerous weather events while above ground, and equally threatened by cold and fatigue exploring the many subterranean environments. The weather effects are perhaps the most graphically impressive element in Solus, although it generally displays the sort of moderate graphical prowess befitting its indie origins. Thick swirling, ominous clouds accompany the formation of deadly twisters, sheets of rain dampen the earth as lightning crackles in the fogged distance, and meteor showers set the sky afire, all in a glorious spectacle that help sell the idea of the world’s inhospitable nature. These dangers are especially believable and salient while playing the game in VR, which I did for the majority of my playthrough. While Solus handles fine in normal mode using a controller, its weaknesses are more apparent and it lacks the sense of presence that VR provides. In addition to witnessing the gorgeous weather effects, one of my favorite VR moments was simply wading through underground pools of water while holding my Move controller high in the air to keep my in-game torch dry while it illuminated my way. Standard first-person controls in normal mode become quite different when playing in VR, which requires the use of two Move controllers. Although Solus‘ controls suffered on launch day, the latest patches have produced one of the finest first-person VR control schemes. Players can choose between standard teleportation movement or use the left Move controller to point in the direction they want to go and the right Move controller’s central button to move in that direction. It’s an intuitive setup that quickly becomes second-nature, and a great workaround considering the Move’s lack of analog sticks. While The Solus Project achieves a great sense of place, it’s ultimately a title plagued by poor design decisions. The more I played, the more I had to weigh my appreciation for the atmosphere against a growing mountain of small complaints. To begin with, a lot of the environments look the same — especially the underground ruins. The caves and decayed pyramids repeat textures and assets, creating deja vu rather than the joy of continual discovery. Furthermore, some of the wide-open areas require a lot of trudging through difficult terrain to pick up quest items, and most of the campaign’s ‘progress blockers’ are just fetchquests for items like keys, ship parts, or alien dolls. The only other puzzles involve an underdeveloped mechanic about placing objects on weighted floor platforms. Solus Project is at its best when it produces a feeling of momentum coupled with the awe of discovering new and exotic spaces, yet its desire to challenge or impede players flies in the face of its strongest elements. Similarly, the save system feels arbitrarily limited, allowing saves only at special pillars. While the game is generous about how many of these pillars it includes, I experienced moments where a quicksave would have been a godsend, particularly after random crashes – a problem between early patches – or after unexpectedly dying. Any sense of discovery quickly fades after being forced to repeat sections. For being a survival and crafting experience, the inventory system in Solus Project isn’t especially intuitive. The interface is clunky (particularly in VR) and players can only carry a small number of items. There are some pickups that expand backpack capacity, but these are easy to miss and the scant few slots they unlock never truly solve the problem. Like other survival games, Solus Project forces players to weigh edibles against other useful items like glow sticks or flashlights. This creates a sense of consequence for player decisions, yet I didn’t feel that it made the game better, or more pleasurable. Despite its limited crafting system (mostly used to make sharp rocks or torches) players will spend the majority of their time walking from one cave to another while trying to maintain their health. 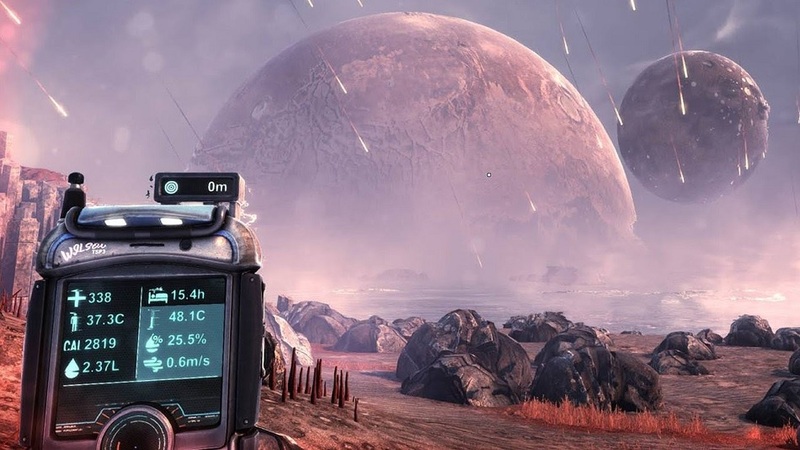 For players who prefer a less strenuous journey, The Solus Project offers a sliding difficulty scale from 0 to 100. At zero, players no longer have to worry about food, water, or temperature, and the limited save system almost ceases to matter. This means players can freely enjoy exploring the alien world and unraveling its mysteries. This also eliminates what some might consider the essential tension of the survival mechanics and drastically changes the experience, but it’s to the game’s credit that it offers this option. Disclosures: This game is developed by Teotl Studios and Grip Digital and published by Teotl Studios and Grip Digital. It is currently available on Windows, Xbox One, and PS4. This copy of the game was obtained via publisher and reviewed on the PS4 Pro. Approximately 14 hours of play were devoted to the single-player mode, and the game was completed. There are no multiplayer modes. Parents: According to the ESRB, this game is rated T and contains Violence and Blood. Players will encounter things like alien skeletons and crucified people in space suits. These images may be disturbing for younger players. Deaf & Hard of Hearing Gamers: The game features subtitles for all dialogue and does not require sound to play. it’s fully accessible.